Although many efforts are made by our municipalities to treat the water supplied to our homes to kill dangerous microorganisms such as bacteria, viruses and parasites, there can still remain in tap water other harmful impurities such as metals, pesticides, etc. In addition, tap water may acquire some unpleasant taste due to the chemicals, such as chlorine, used during the treatment. Water filter pitchers can be successfully used to improve the quality of your tap water. They can help eliminate harmful impurities and allow the water find its pleasant taste and transparency while preserving the beneficial salts and minerals. The filters consist essentially of activated carbon and ion exchange resin. Activated carbon has the action to filter the chlorine, certain pesticides and other organic impurities. The ion exchange resin improves the taste and removes odors. It also softens the water and reduces the presence of limestone and metals such as lead, copper and aluminum. It usually takes three to four minutes to filter a liter (about 4.2 cups) of water. There are different types and sizes of water filter pitchers. The 5 to 10 cup models have the advantage of fitting into your refrigerator door. Some brands also offer filtering water dispensers that can contain larger quantities of water. These won't fit in refrigerator doors, but they are still small enough that they can be placed inside the refrigerator. 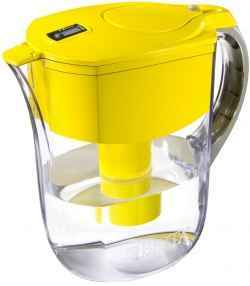 You will find below a description and comparison of three of the most popular water filter pitcher and dispenser brands: Brita, PUR and ZeroWater. The pitcher comparison section you will find below should help you decide which pitcher will respond best to your needs. Once you have filtered your water, you can use infusion pitchers and infusion bottles to flavor it with natural fruits and take it with you wherever you go, so that you're never short of clean and delicious water whether you are exercising, working or just relaxing. At the end of this article, we will also recommend some of the popular infusion pitchers and bottles. All of the above filtration pitchers/dispensers are filled from the top and are BPA free. 1FILTERING EFFICIENCY: With regard to filtering capability, the ZeroWater pitchers and water dispensers are no doubt some of the best. Not only do they offer more complete water filtration thanks to the 5-stage filtration system, but they also allow you to verify that the achieved filtering level is acceptable by testing it with the provided TDS meter. Note also that, for added convenience, some models provide a handy dispenser at the bottom of the unit that allows you to access water without removing the unit from the fridge. In terms of filtering capability, the other brands are quite comparable with each other. 2FILTER DURATION: This parameter is a function of the tap water quality. The more your tap water has impurities, the less your filters will last as they will have to "work" harder. Here are the number of filtered gallons of water per filter claimed by the various brands: ZeroWater: 30, PUR: 40 and Brita: 40. But these numbers should not be taken literally since, as mentioned, filter duration depends on the quality of water being filtered. Also, the fact that ZeroWater has the lowest number (30) does not reflect negatively on the ZeroWater brand, given that it is one of the filters that filters best, and hence does a lot more "work" than the others. 3TASTE: Regarding taste, the water produced by Brita and PUR pitchers tastes quite good, and the taste of ZeroWater filtered water is also quite acceptable. This is understandable, as the more complete the filtering process is (like in the ZeroWater case), the less taste your water will have (remember that 100% pure water has no taste at all!). 4WATER QUANTITY: If you need large quantities of filtered water in your fridge, then consider the ZeroWater 23 cup, PUR 18 cup, or Brita Ultramax 18 cup filtering water dispensers which can contain much larger quantities of water than pitchers can. They all fit nicely in the fridge but not in the door. 5STYLE/COLOR: If you are looking for a pitcher that comes in various colors, then you may want to consider the Brita Grand (10 glasses) pitchers as they offer a wide choice of stylish colors. In summary, when you compare water filter pitchers for filtering your tap water, if you are looking for the ultimate filtering, go for ZeroWater; if you are looking for larger quantities of water, go for either ZeroWater, PUR or Brita water dispensers rather than pitchers; if you are looking for good taste, you can choose anyone as all produce good tasting water; and finally, if you are looking for convenience with acceptable levels of speed, taste, and filtering, go for Brita or PUR. The Brita, PUR and ZeroWater filtering pitchers and dispensers are all available on Amazon. Please click the pitcher of your choice below to see price information or to purchase (if you need additional information on each pitcher brand, please refer to the following sections further down, where each pitcher brand is described in more detail). Note: If you own a standard water cooler or planning to get one, you may also want to consider the ZeroWater ZJ-003 Water Cooler Filtration Bottle which brings you all the benefits of 5-stage ZeroWater filtering for much larger quantities of water without the hassle of having to buy and lift heavy water bottles. The unique two-chamber bottle filtration system fits any standard water cooler. Once you fill it with tap water, you will have plenty of cool filtered water for a long time. The 4.5 gallon bottle comes with two ZF-201 filter cartridges and a free TDS Meter that lets you know when the filter cartridges need to be replaced. Note that when you click the pitcher images below, you will be offered additional colors to choose from whenever available. 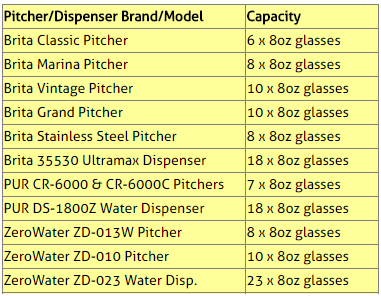 If you need additional information on each Pitcher brand, please refer to the following sections below where each pitcher brand is described in more detail. 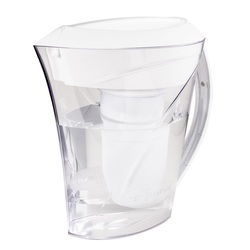 Brita has a large line of filter pitchers, in various shapes and sizes. Thanks to their slim and compact design, the Brita water filter pitchers can be stored in refrigerator doors. But despite their compact size, the various Brita pitchers can hold from 40 to 80 fluid ounces of water, the equivalent of five to ten 8-ounce glasses. Their sleek design makes for effortless transport, refilling, and pouring. The activated carbon and ion exchange resin filter found in these pitchers and dispenser removes from tap water any chlorine content and impurities such as lead, copper, mercury, cadmium, and zinc, reducing their potentially harmful effects. It can remove over 94% of chlorine content and over 95% of lead and other harmful impurities. The sponge-like filtration system is effective in reducing the taste and odor of chlorine. The end result is clean, better tasting and healthier water. The various Brita pitcher models (Classic, Marina, Vintage, and Grand) offer different sizes as shown in the above table. The 10-glass Brita Grand pitcher shown in the picture on the left differentiates itself from the rest of the Brita family in that it comes in many colors and is equipped with an electronic filter change indicator. Brita also makes the larger 18-glass Ultramax filtering water dispenser that can be placed on a refrigerator shelf or on the kitchen counter. Note that the water pitcher and water dispenser filters should be changed every 40 gallons or two months, and that the Brita Marina and Brita Stainless Steel pitchers, as well as the Brita Ultramax Dispenser are all equipped with a filter change indicator. The PUR CR-6000 and CR-6000C water filter pitchers feature a compact design that easily fits in most refrigerator doors. They can hold up to seven 8-ounce glasses. The PUR DS-1800Z water dispenser can hold up to 18 8-oz cups of water and also fits in the refrigerator, but not in the door (see picture on the right). The PUR pitchers and dispensers have a two-stage filtration system that can remove 99.9% of harmful microbial cysts as well as over 97% of other contaminants, such as lead and chlorine. In addition, pharmaceutical residue often found in the water supplies of major metropolitan areas is reduced by 96%. The CR-6000C is also equipped with an indicator light alerts you when it's time to change the filter with green meaning still OK, yellow meaning a warning, and red meaning that a filter change is needed. All PUR pitchers and water dispensers are tested and certified by NSF International. The ZeroWater ZD-013 pitcher is also a compact design pitcher that can store neatly right in your refrigerator door and can hold eight 8-ounce glasses of water. The ZeroWater ZD-010 water pitcher comes with all the nice features of the ZD-013 pitcher but is larger and can hold 10 cups of water. The ZeroWater ZD-023 water dispenser fits nicely in the refrigerator and can hold 23 cups of water. For those who need much larger quantities of filtered water and who own a standard water cooler, there is also the option of getting the 4.5 gallon ZeroWater ZJ-003 filtration water cooler bottle (see Amazon products section in this article for more details).. The first layer of filtration with activated carbon removes the chlorine taste and organic impurities from the tap water. The ion exchange stage removes all dissolved harmful metals such as Aluminum, Zinc, Lead, etc. that may be left in the water from public treatment systems or flowing through metallic pipes. The additional three stages of filtration remove all other impurities. With these filtering pitchers and water dispensers, you don't have to accept purity claims at face value.You can literally test your water yourself with the included TDS (Total Dissolved Solids) meter to ensure that you're getting the cleanest water possible. When the TDS meter indicates zero you have water with 99.999% of chlorine, lead and other impurities removed. Powered by two easy-to-replace 1.5-volt button cell batteries, the TDS also indicates the status of the filter so you know exactly when a filter change is required. ZeroWater filters are lab-certified for 22.5 gallons per filter under the strictest conditions, but customers have reported that their TDS meters indicated fiter change not before over 30 gallons of water were filtered. Note that the lower the TDS of your tap water, the longer the filters will last.